It can be a pastime of some gamers to chortle at spelling errors or sloppy typos in video games, with many recently enjoying a typo by Capcom in its now infamous Resident Evil Revelaitons packaging for, of course, Revelations. While that version of the packaging became, bizarrely, a collector's item of sorts, it seems Nintendo feels the pain of those of us that missed out, and is making sure that all 3DS owners have some poor grammar to point at. This error isn't in some niche release that hardly anyone will buy, but in New Super Mario Bros. 2. 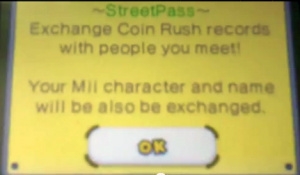 The dodgy sentence in question appears when Coin Rush is first unlocked, and in case you think the screengrab above is an elaborate forgery by someone with way too much time on their hands, you can check out the video from GameXplain, below. We didn't actually spot this when playing it ourselves, possible because we were giddily tapping the 'OK' button to actually play the game. So, does seeing this prompt feelings of schadenfreude — pleasure derived from the misfortune of others — or do you not give one hoot? Typo? It that really you? @Smitherenez - Oh the irony in what you just wrote. Another sign that your jab at Nintendo was rushed. Two be, or not two be? Hehe. It's not too bad because it's not like it's a screen you can see more than once. I would laugh more if something more important, such as GAME OVER was misspelled.....but actually, I don't think that a single person has seen the game over screen yet.... waaayy to many 1=ups. we need a comment like button here. Dazza's incredibley brilliant comment can not go unnoticed . why are typo's so bad? I didn't catch it either and I probably reread the screen capture five times before finally seeing it. Weird how our minds can play tricks on us, even if they're helpful tricks by editing mistakes. Well, now we all know what the first DLC will be for NSMB2. I would not have noticed this myself. Tricky optical illusions. So are you guys going to be pointing out every typo you see now? Because I found an embarrassing one in Theatrhythm: Final Fantasy. Nintendo itself is one big typo. It's just an just extra word, how is that such a big deal? I needed to read it 4 times. I was like,"I don't see what the hel... ooooh..."
I couldn't even see the mistake myself, no matter how many times I read that screen. Had to read the comments to spot it. Damn you, internal spellchecker! @Dazza Simply brilliant. You deserve a cookie. Oh dear... looks like someone beat me to the jar. This is really a bad blunder, though not really that bad, since everyone will probably just shoot through it. But now that it is out there, there is no way to fix it. Exchange Coin Rush records with people you meet! Your Mii and name will also be exchanged. That's what it says. Why is everyone saying it's wrong? Did not read that text carefully. Darn it. "But now that it is out there, there is no way to fix it." I'm one to chortle at it. It's hard to spot because our brains auto-fix it, and you don't notice 'til you look really closely. I've noticed I've had spelling errors in my comics before and I proofread them about a dozen times. I wouldn't spot it until years later, and NONE of my readers ever noticed. So, everyone does it and it's more something to laugh about than gnash your teeth over. ... and somebody just lost their job for letting that one slip through the cracks. Wow. I had to read that like three times to even catch it. Anyways, I hate Grammar typos. Spelling errors are easy to catch, but I speed-read so fast I always just auto-skip over the misplaced words. Makes me nervous when I proofread papers. Unbelieveable. That's so that increbibly stupid. I mean, just how dum are tese people? Is Nintendo so flawless that they can't make a typo here and there? I don't think so. The company is run by people after all, not game making genius gods like many would believe. Why is this typo full of grammerless? @Mk_II And I want my money back for sining up on this site. They spelled 'revelations', 'revelaitons'! Aslo, it's hilaroius all tehse people making tyop jokes taht keep geting misunderstanded. Well that was kinda minor typo. I didn´t even notice it at first. I thought Nintendo had changed, but once again they revert to typo. Why be your Mii no be exchanged? I really don't think this is comparable to the "revelaitons" fiasco. It's pretty awkward/surprising that it got through with a typo, but it's just one extra word on a page most people won't pay any attention to, and will probably only see once (Probably how it was missed). It's not like they put New Super Morio Bros 2 on the cover. @Pengaweeno Look at the bottom line again. It took me a few looks to see it. It's not a spelling error, it's a grammatical error. I've been shopping for e-books a lot lately since I bought a tablet (Nexus 7) and it's amazing how many grammatical errors (grammos?) and typos there are in publisher book descriptions. You'd think publishers would have editors to review everything before it goes public. But they just don't seem to care. This isnt the only typo. There's also at least one in the Operations Manual about DLC... telling us "How to Purchase Downloadble Course Packs". I don't know if this deserves any attention at all. My guess is it has nothing to do with localization and more with a simple typo that everyone makes every day of their lives that simply got by overlooked by testers for the same reason it was by almost everyone else — your brain is trained to skip words in a sentence that are unnecessary for comprehension. An extra be goes completely unnoticed unless you're poring over the sentence carefully. As bugs go, chalk this one up as 'Extremely Minor'. When Nintendo starts releasing games with dozens of game breaking bugs (cough: http://www.gamefaqs.com/boards/960495-lego-harry-potter-years-1-4/55523165), I'll be worried. Lol. I guess they called Drawcia in the development team to slap something extra. "Conglaturation. You have completed a great game. And prooved the justice of our culture. Now go and rest our heroes!" Stupid typo but no big deal! I figured it must have been something funny so I was dissapointed to see it was just a grammatical error... doesn't look for Nintendo but meh, it happens. @TysonQ7 I know a patch is always possible, but why go through the trouble of fixing it if it is such a small error as that. Maka Wuhu on the other hand adversely affected game play. Where'd my comment go? :S EDIT: Oh well I'll just say it again. Meh. Does an extra word somehow change anything about the gameplay or storyline in any way shape or form? No. It doesn't matter, it's not even patch worthy. @WiiLovePeace We demand a patch! How dare they make a mistake like that! This is worse than the Maka Wuhu glitch, a grammatical error is unforgivable! We must hang the person who did this! it sounds like you trade your mii to a random loser!AND DON'T GET IT BACK! ROTFL! Uh-Oh The truck have started to move. Ah Metal Gear NES never fails to dissapoint in quoting. Oh, and one of the Nintendo Power Vol. 250 Famous Character lines. Toad: Thank you Mario, but our Princess is another castle. Looks like NP missed a word in a very famous quote. p.s. super Mario 64 has a typo.when you first talk to Yoshi he'll say "Mario? it is really you?". its supposed to say "Mario? is it really you?". It actually took me a few moments to notice what it was, I kept looking at "Character" waiting for it to be spelled wrong. Can you feel ze Schadenfreude?! Also on the back of the manual it says "Note: Co-op Play requires two Nintendo 3DS systems and two game cards and two game cards (each sold separately).". For people who missed it "two game cards" is said twice. Be glad that spelling greatness has greatly increased since spelling even began! This reminds me of the Paris in the the spring sign. Easy to whoosh over. Mistakes from Nintendo, not surprising. (YOU HEARD THIS HERE FIRST, I FOUND THIS OUT BY MYSELF)THERE'S ANOTHER TYPO ON THE POWER UP ACTIONS SIDE OF THE ACTION GUIDE IT SAYS "Note: Co-op Pay requires two Nintendo 3DS systems and two game cards and two game cards (each sold separately."